This is a Sponsored post written by me on behalf of Vtech. All opinions are 100% mine. Everyone is fascinated by cameras, including children. However, if your kids are anything like mine, they tend to break things, especially expensive electronics, and cameras are pretty high on that list. You can buy your kids disposable cameras, but most likely they’ll break into them, making the film trash. 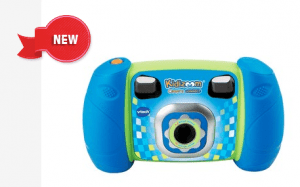 I was asked to review the Kidzoom Camera by VTech. This camera is great for taking pictures, and if your little one drops it, you don’t have to worry about finding a way to buy a brand new one, because it bounces and doesn’t break. This camera doesn’t just take pictures, they can edit the photos with great effects, take video, and even play three different video games with the click of a button. They can also string together different photos for a stop motion animation videos. This camera features four times digital zoom for four times the fun! The Kidzoom holds up to 800 photos, and has the ability to connect to the computer, where they can store their movies and photos so that you can share them on social media with friends and family. You can also connect the Kidzoom to VTech’s Learning Lodge for more fun. This camera is great for kids from ages 3-8, and makes a great Christmas or birthday gift for any child in your life, and it’s very affordable at just $39.99. Let your child experience the magic of being the family photographer, and watch their imagination go wild, without losing hundreds of dollars replacing your camera, or phone if they drop the camera. Do your children like to take pictures? If so, do they have their own camera, or even the Kidzoom by VTech? Let me know in the comments!